The PFM 9.2 DRO base unit is the midsized lathe with all the bells and whistles including fixed-post trolley, speed-lock cutting head, and electronic reporting that monitors lathe use, efficiency, and ROI. DRO computer with digital display of live run-out and “odometer” readings that provide motor hours, number of cuts, average comp time, and ROI data. Live run-out provides assurance that manufacturer specs are met with every brake job (and your shop sees NO COMEBACKS). The DRO odometer allows you to track the performance of the lathe so you can measure profitability and schedule maintenance when needed. Speed-Lock cutting head requires no hand tool set-up and adjusts with one hand. Set-up is faster and more accurate with fewer hassles for the technician. 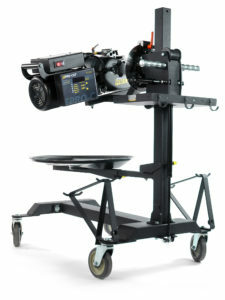 Disc-lock trolley features sealed bearings, a positive locking mechanism, and fixed post to accept GYR upgrade. Also provides a wider base for greater stability and new carriage design for perfect zero-gravity effect. 1.0 HP motor has all the power you’ll need and the convenience of 110v electrical supply. Sculpted lathe body with built-in handles provides natural vibration dampening and is virtually indestructible.